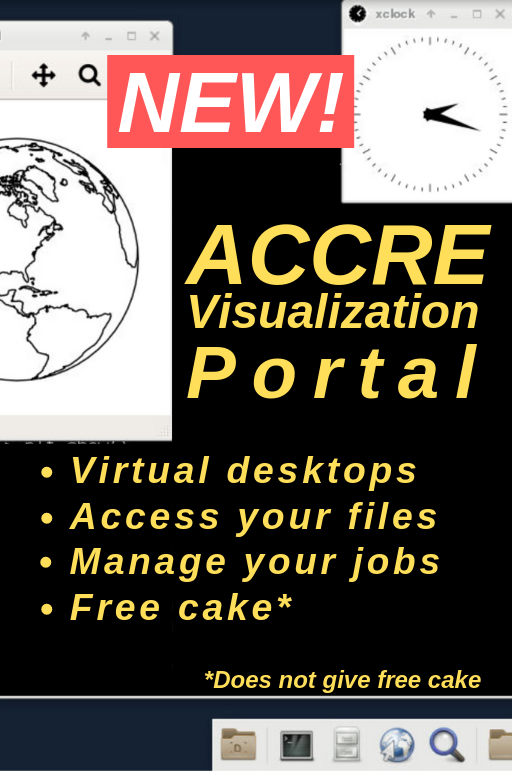 The ACCRE Visualization Portal is a new graphical interface to the ACCRE cluster powered by Open OnDemand. This interface allows users to access all cluster resources conveniently through modern web browsers, and provides the ability to create virtual desktop jobs that create a temporary desktop environment within the cluster on a compute node for interactive work and plotting data. This portal is initially considered a “beta” service as it represents a completely new way for our users to interact with the cluster. While we believe that the system is ready for production from a deployment standpoint, we are still working to understand the needs of our clients in particular and to write relevant documentation. Any user feedback is appreciated, so please open a helpdesk ticket if you encounter difficulties or have suggestions. 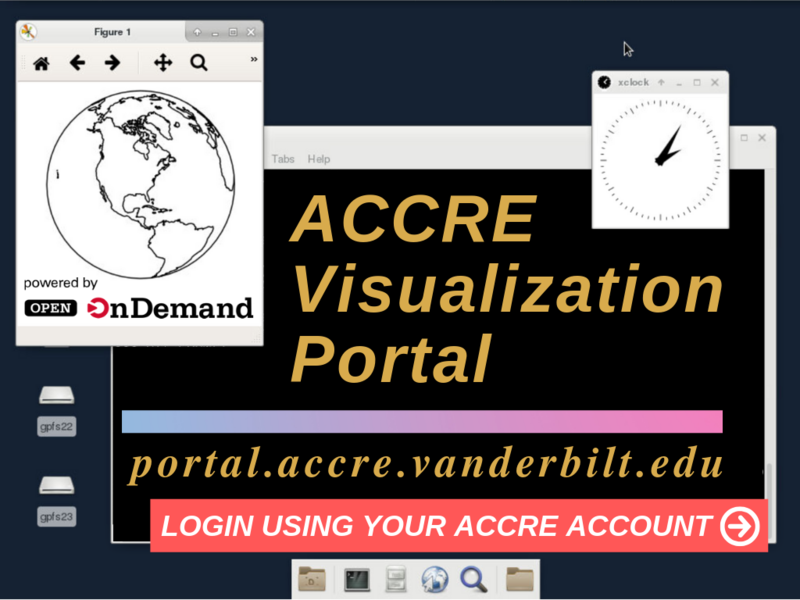 The portal is accessed through any modern, up-to-date web browser at https://portal.accre.vanderbilt.edu. 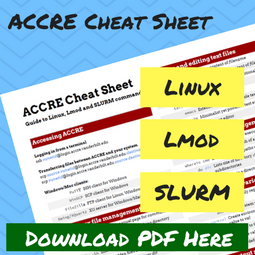 This address will redirect you to keycloak.accre.vanderbilt.edu where you can enter your ACCRE cluster username and password (not your VUNetID password) to access your account, and redirect you back to portal.accre.vanderbilt.edu. Be careful that this is your primary cluster credential and must be kept secure. Do not attempt to log into the portal from untrusted machines or browsers that are not fully up to date. 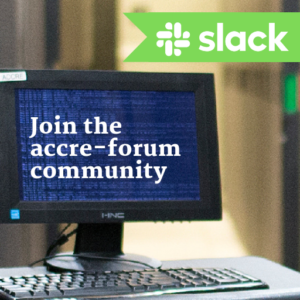 Do not under any circumstances enter your ACCRE password into a site that is not keycloak.accre.vanderbilt.edu and does not offer a valid certificate. Always remember to promptly sign out when you have completed your session or are away from your desk. Signing out of the portal will not affect any running jobs or interactive desktops – these will still be running when you sign back in. Clicking on the “Home Directory” item in the “files” menu will take you to the file explorer application. This application allows you to browse your directory tree, and securely upload and download files to your workstation. You can view text files as well as standard image formats such as JPG and PNG in the browser window. The file explorer will also allow you to edit files with the ACE text editor. This modern editor provides syntax highlighting for most languages, automatic indentation, and a number of other features designed with software development in mind. Under the “jobs” menu there are options to view “Active Jobs” and to open the “Jobs Composer” application. 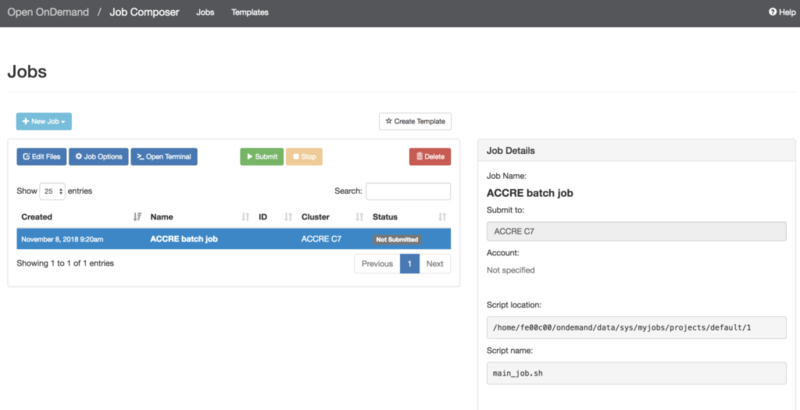 The active job viewer will show you the status of all your running jobs on the ACCRE cluster. The Jobs Composer application allows you to develop jobs and job templates through a graphical interface, then submit and manage jobs at the click of a button. Under the “clusters” menu the “Shell Access” item will open a tab with a typical ssh login to a gateway node, only through your web browser rather than through any software installed on your workstation. Under the “Interactive Apps” menu the “ACCRE Desktop” item will open a tab where you can request a temporary desktop on an ACCRE compute node to do interactive, graphical work with applications such as MATLAB or Python Matplotlib. The way this works is that you only request the resources you need in terms of CPU cores, memory, and wall-clock time, just as a regular batch job. The resource request is processed just like any normal job, so it may have to wait in the queue until resources are ready. Once ready, you will see an entry for your desktop if you click the “My Interactive Sessions” link in the top navigation bar. There will be a link to open the desktop in a new tab and another sharable link to access the desktop in view-only mode, so that you can screen share with collaborators. Since the desktop request is handled as a normal batch job, we recommend requesting a desktop 24 hours in advance if possible and requesting anywhere from a few days to a week. The desktop will remain active when you close your browser tab or log out from the portal. It will only be deleted when you request deletion from the portal or press the “log out” button from within the desktop, or when time expires. When you create a desktop, you set the initial screen resolution. You can click the “reset resolution” button will set the size to that of your browser window. If you would prefer for the desktop resolution to rescale to your display, you can fix this from within the desktop. Click on the NoVNC tab that is partially hidden on the far left of the desktop window to bring it out. Then click on the gear icon to access settings. Change the “Scaling Mode” to “Remote Resizing” to make the desktop screen resize to your browser window. Note that resizing the desktop may cause some software packages such as MATLAB to report errors, which is why this is turned off by default. If your desktop is larger than your current browser window, you may move around the desktop by clicking on the hand icon in the NoVNC tab and dragging the desktop around within your browser window.